Blackberry bushes need regular fertilization to grow big, juicy berries. Most blackberries require just one application of fertilizer annually, given in early spring right before they begin to grow. But some blackberry plants require a second application of fertilizer. If your blackberry bush has pale green or yellow leaves or thin spindly canes, give it a second dose of fertilizer in June towards the middle of the growing season. Test the pH of the soil around your blackberry's soil. This can be done by following the instructions on a home soil pH testing kit or by taking a sample of the soil in to your local county extension office for testing. The soil's pH will determine the type of fertilizer that you apply to your blackberry's soil. 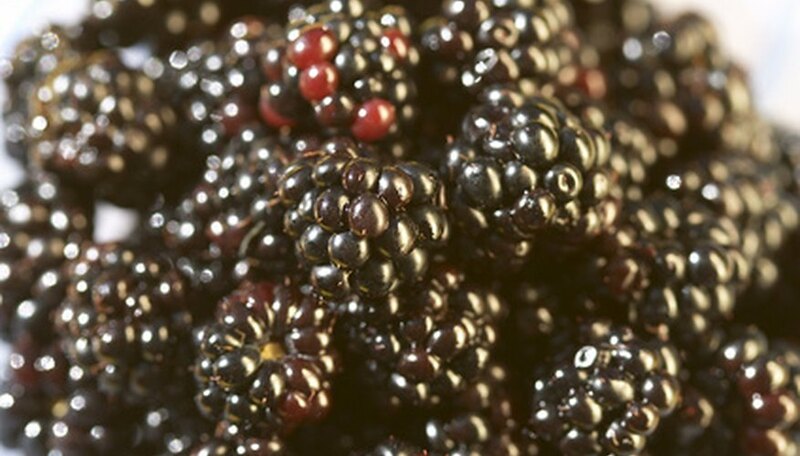 Fertilize your blackberries in early spring before they break dormancy. Spread a top dressing of 1/4 pound actual fertilizer evenly over the roots of each one of your blackberry bushes (keep the fertilizer a few inches away from the bush's stem or you may burn the plant). Use 1 1/5 pounds of 21-0-0 fertilizer if your soil's pH is above 7 and 1 2/3 pound of 15-5-0 fertilizer if the pH is 6.0 or less. Apply a second application of fertilizer in June if your blackberry's growth is poor. Apply the same amount of fertilizer but this time use a 21-0-0 fertilizer regardless of your soil's pH. Water your blackberry with 1 to 2 inches of water after each fertilizer application. Spread a 2- to 3-inch layer of organic mulch over your blackberry's soil. It will help the soil retain water and fertilize the blackberry as it decomposes. Keep the mulch 3 to 4 inches away from the blackberry's stem and extend it roughly 1 foot beyond the reach of the blackberry's foliage.